Describe electrolysis from a perspective of redox reactions. 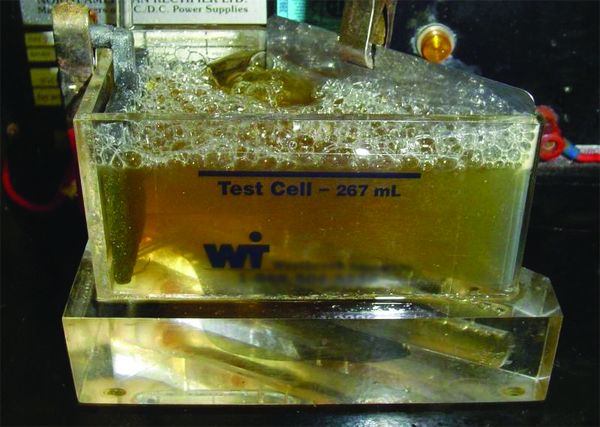 Give examples of electrolysis applications. Up to this point, we have considered redox reactions for processes that are spontaneous. When set up as a voltaic cell or battery, such reactions can be used as a source of electricity. However, it is possible to go in the other direction. By forcing electricity into a cell, we can make a redox reaction occur that normally would not be spontaneous. Under these circumstances, the cell is called an electrolytic cell, and the process that occurs in the cell is called electrolysis (Figure 14.5 “Electrolysis”). In an electrolytic cell, electricity is forced through the cell to induce a nonspontaneous redox reaction. Here, the redox reaction 2 H2O → 2 H2 + O2 is being caused by the introduction of electricity, which is supplied by the battery. Normally we expect elemental sodium and chlorine to react spontaneously to make NaCl. However, by using an input of electricity, we can force the opposite reaction to occur and generate the elements. Lithium, potassium, and magnesium can also be isolated from compounds by electrolysis. Another application of electrolysis is electroplating, which is the deposition of a thin layer of metal on an object for protective or decorative purposes (Figure 14.6). Essentially, a metal object is connected to the cathode of an electrolytic cell and immersed in a solution of a particular metal cation. When the electrolytic cell is operated, a thin coating of the metal cation is reduced to the elemental metal on the surface of the object; the thickness of the coating can be as little as a few micrometers (10−6 m). Jewelry, eating utensils, electrical contacts, and car parts like bumpers are common items that are electroplated. Gold, silver, nickel, copper, and chromium are common metals used in electroplating. Source: Photo courtesy of Fstep, http://commons.wikimedia.org/wiki/File:Hullcell.jpg. Electrolysis is the forcing of a nonspontaneous redox reaction to occur by the introduction of electricity into a cell from an outside source. 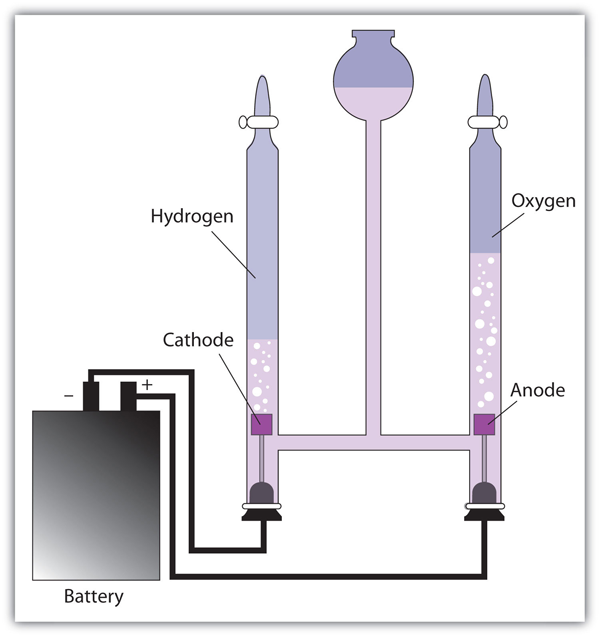 Electrolysis is used to isolate elements and electroplate objects. How does the operation of an electrolytic cell differ from a voltaic cell? List at least three elements that are produced by electrolysis. Write the half reactions for the electrolysis of the elements listed in Exercise 3. Based on Table 14.1 “Standard Reduction Potentials of Half Reactions”, what voltage must be applied to an electrolytic cell to electroplate copper from Cu2+? Based on Table 14.1 “Standard Reduction Potentials of Half Reactions”, what voltage must be applied to an electrolytic cell to electroplate aluminum from Al3+? Electrolysis by Jessie A. Key is licensed under a Creative Commons Attribution-NonCommercial-ShareAlike 4.0 International License, except where otherwise noted.